Thank God for some quick thinking bystanders. Some Cape Cod beach goers found a great white shark that had washed up on the beach, and we able to save it and release it back into the water! Witnesses say the 7-foot male shark got stuck Monday near South Beach in Chatham, Massachusetts, as the tide went out. 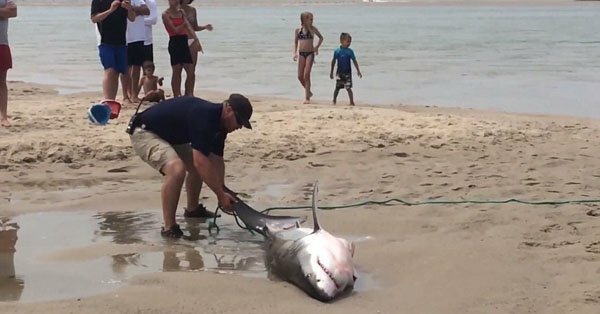 Beachgoers kept the shark wet by splashing it with buckets of water until officials attached a line to its rear caudal fin and Harbormaster Stuart Smith pulled it back into open waters. Officials say it took about an hour and video of the difficult process of freeing the animal has since been uploaded to YouTube. Watch the video below. You can see more photos of the stunning rescue at this link.